As you know, I love cookbooks and this is one of my first non-cookbook reviews that I am super excited to tell you about. 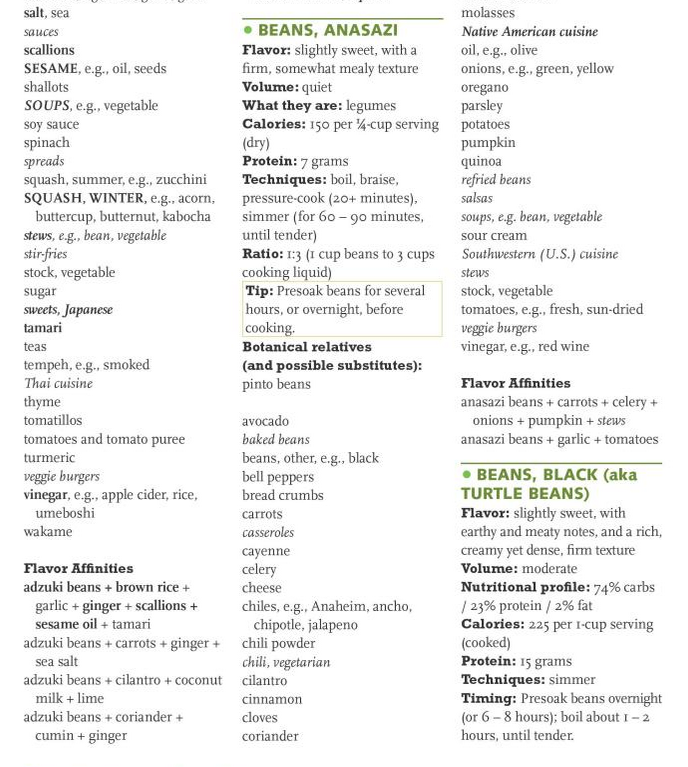 Granted, it may not be a cookbook but it is still all about the food: The Vegetarian Flavor Bible. Does the name sound familiar to you? 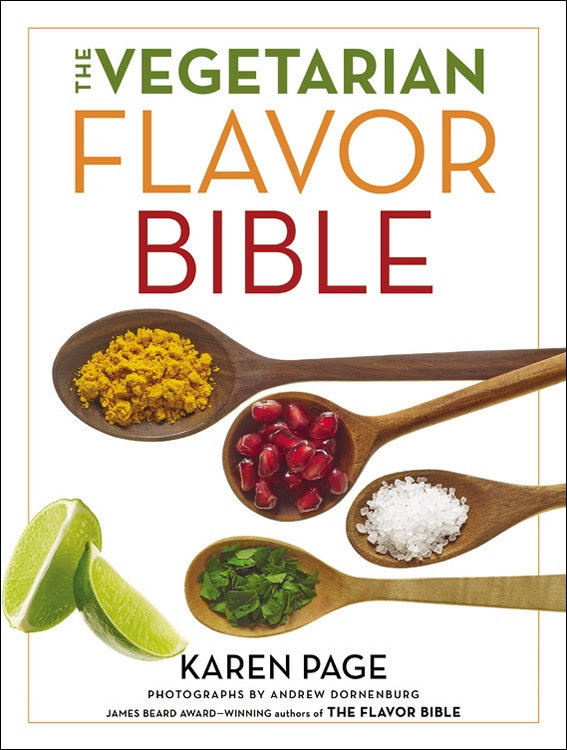 Karen Page also wrote the classic (original) The Flavor Bible. Both books describe the flavour of various food ingredients including basic preparation methods and tips and then has itemized lists of food pairings. In the The Vegetarian Flavor Bible, she tackles vegetarian combinations. Sounds weird? Let me explain by example, because truly this is a magnificent compendium for anyone interested in being creative in the kitchen or simply eating good food. Below is a screenshot from the Amazon preview. 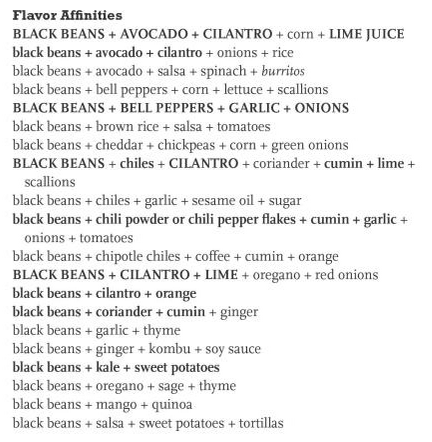 Whereas The Flavor Bible had 5 pages dedicated to all the beans (notably black beans, cannellini, fava, flageolet, green beans, kidney, lima, navy, pinto, red, white) plus another page for chickpeas, The Vegetarian Flavor Bible has 15 pages for all the beans (in addition to the above, it also includes adzuki beans, anasazi, cranberry/borlotti, fermented black beans, gigante, french green beans, long beans, mung beans, soy beans/edamame) and chickpeas have almost 2 pages now. This is a veritable treasure trove. More common suggestions are capitalized, italicized or bolded. 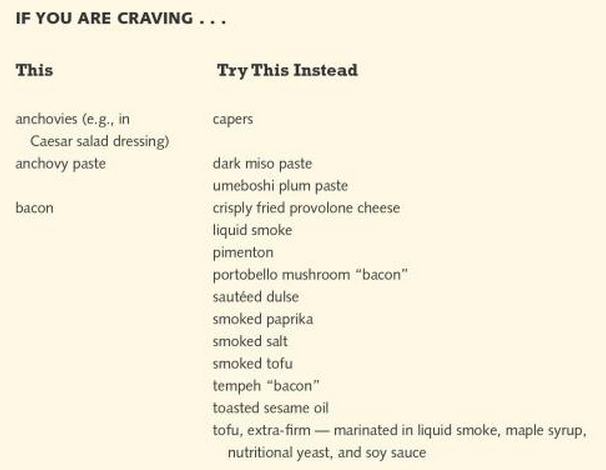 Speaking of capers, if you ever needed proof of her authority in flavour, take note of this. Under capers, her tip: Rinse, or soak for up to 24 hours before using to quiet their flavor. Consider crisping for a minute or two in very hot oil before using them to garnish salads. Um, YES!! That was my latest cooking revelation, too. Crispy capers are marvelous! I need to read through this to uncover more gems. Lastly, to quote her again: If you master a single recipe, you’ll learn how to cook a single dish. If you master the dynamics of flavor, you can make anything taste better. Thankfully, the publisher allowed me to giveaway the cookbook to three readers living in the United States or Canada. To be entered in the random draw for the book, please leave a comment below telling me about your favourite vegetarian ingredient and its flavour affinity (ie., what you like to pair it with). The winner will be selected at random on December 5, 2014. Good luck! I first met Lorraine Johnson during a Jane’s Walk last year where she, along with Nancy Chater, led a small group through the ET Seton Park in Toronto to discuss space, water, history as well as to show us the edible weeds in the Don Valley. Interspersed around Tremco, the largest employer in the Don Valley, Lorraine showed us burdock and its tasty root; garlic mustard, an invasive plant that is good in salad and pesto; dandelions, where the young green leaves can be used in salads; and lastly sumac, a shrub with edible flowers. She had prepared sumac lemonade and garlic mustard bruschetta for us to try! I preferred the bruschetta to the lemonade, but it was exciting to think of what you could forage from a Toronto park. When I saw Lorraine had written a book, City Farmer, about gardening in the city, I was excited to see what perspective she would bring to the table. Sadly, this wasn’t a ‘how-to’ book about creating your own garden, as I’d love one of those, rather it was an equally awesome empowering read wherein Lorraine shares her passion for gardening. Her tales of procuring gardens in odd and far off places, dilemmas between community gardeners, and her own foils with raising chickens in her Toronto backyard are amusing and engaging. During our walk, she retold her story about making dandelion wine and how it exploded in her basement which is also recounted in the book. In addition to personal anecdotes, she highlights the importance of local food, with figures showing sometimes local, small-scale operations may not be more environmentally friendly. Obviously the best, most locally grown food is from your own backyard. 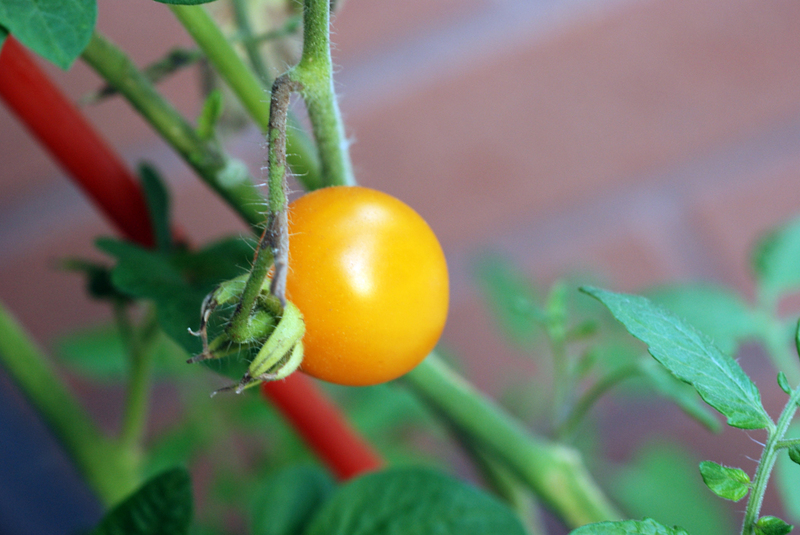 The other benefits of backyard gardening include people tend to eat more vegetables as well! Schools in the US have started to replace gym classes with gardening classes, as you get exercise with gardening as well as the skills to become a lifelong gardener. 🙂 What I loved about the book is Lorraine that dispelled my own myth that you need a backyard to have a prolific garden. 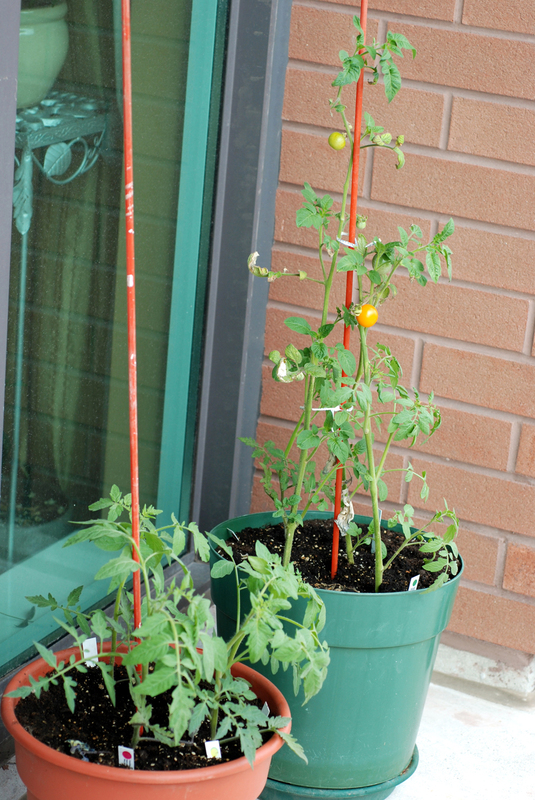 She highlighted groups within and outside Toronto that encourage community gardening with limited resources. 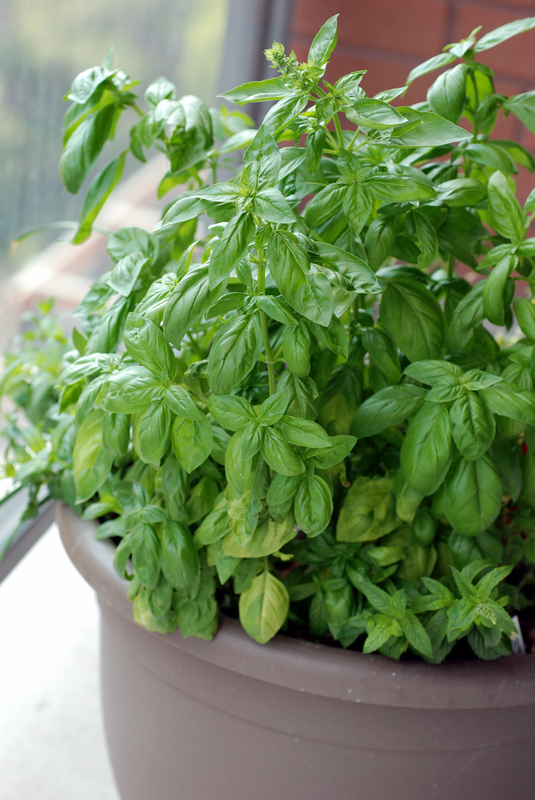 She also features creative ways of gardening, including Marco Pagliarulo‘s balcony pot that houses both a compost and plants in one. She describes guerilla gardening, where rogue gardeners plant in public places. 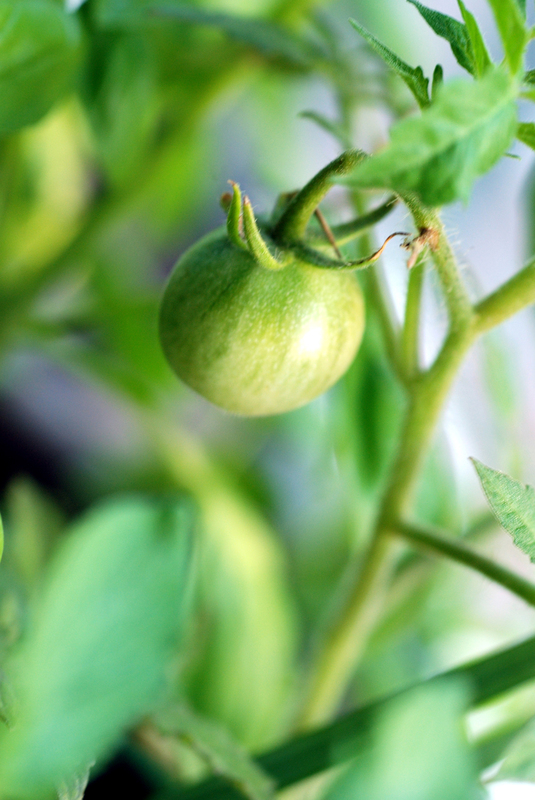 With a lone tomato plant within a flowerbed, would you stop and ponder its existence? Would you be tempted to pick the ripe tomato? While the public is content with flowering plants, why is it so odd to have edible plants on public property? Why is it so uncommon for people to have vegetables in their front yard? Harvesting fruits and vegetables is typically done with privacy. There is a prolific mulberry tree near the bus stop where I used to work and it always brought a smile to my face when I would see someone pick the berries to snack on as they waited for the bus. There were also a lot more mulberries that landed on the ground, though, recolouring the sidewalk purple. It wasn’t that long ago, that I said I would not be gardening this year: I had plants on my balcony three years ago, but they would quickly dry out and my red pepper never grew big enough to be picked. I was worried I wouldn’t be able to water my plants often enough, with the hot sticky Toronto summer that has recently dawned upon us. My mom assured me that with a deep-dish planter with moisture-retaining soil, I would have a greater chance of success, so my parents gave me a planter filled with mint, basil, and garlic chives for my birthday.